PayDayOne.com Reviews – Legit or Scam? PayDayOne.com is a website specializing in payday loans for people seeking up to $1,000. Pay Day One offers to approve loans quickly enough that you even have the opportunity to have the money deposited into your account on the next business day if you complete your application by the time the clock on their homepage counts down. ThinkCash.com Reviews – Legit or Scam? 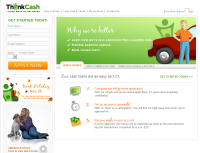 ThinkCash.com is a payday loan website that offers quickly approved loans of up t o$1,000 for first time applicants. If you apply for a payday loan through ThinkCash.com and are approved before 6 pm Eastern Time, you can have the full loan amount deposited into your checking account by the next business day. A payday loan is a specific type of loan. Sometimes companies refer to these types of loans as “cash advance” loans. These loans are meant to act as an advanced payout of your paycheck, and are intended to be paid back quickly. Each state has various rules and regulations regarding the approval and dispersement of payday loans.